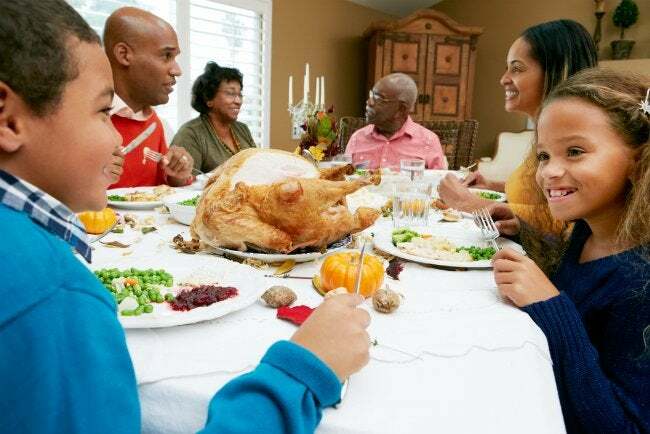 Whether you're expecting a quiet circle or a boisterous crowd, there are several steps you can take to get a head start on hosting this year's Turkey Day. At Thanksgiving, it’s easy to lavish so much attention on preparing the meal that you forget about preparing the dining room. Here are a few suggestions for getting the room ready for turkey day. In the days before Thanksgiving, give the dining room a thorough cleaning, getting rid of cobwebs and treating stains on seat cushions. And don’t just clean the room, clear it! Banish clutter, box up knickknacks, and remove any furniture you don’t plan on using. The room will feel larger and more comfortable, and you’ll free up space on surfaces for side dishes, dessert plates, and other service items. Make sure your table can accommodate the number of guests you expect. If it falls short, consider topping it with a standard 4′ x 8′ sheet of plywood. Once it’s covered with a festive tablecloth, no one will be the wiser. Scope out the traffic flow around your table. If there isn’t enough space, try running the table diagonally. Or remove a leaf and set up smaller satellite seating in other rooms. Finally, make sure you have enough chairs to seat everybody. Don’t forget—benches are great solutions for tight quarters.